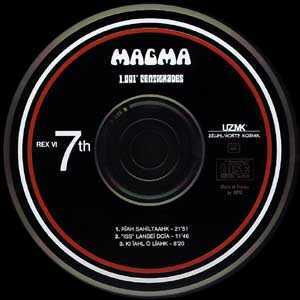 MAGMA returned to the studio in 1971 to record its second album, 1001 DEGREES CENTIGRADE. By this time the guitarist Claude Engel had quit the group and the brass section was re-invigorated by the arrival of Jeff SEFFER on sax and Louis TOESCA on trumpet. All the factors contributing to the originality and grandeur of KOBAIA remained in place, reaching a more profound form in this second opus. If the two pieces composed by Teddy LASRY and Francois CAHEN allowed a more jazz-oriented tendency to filter through, it is in RIAH SAHILTAAHK where we hear the ideas presented on the first album developed with the greatest power. At over 20 minutes, this Christian VANDER composition is astounding, as much by its richness and incredible variety of themes as by the perfectly-disciplined rhythmic force; moreover, it showcases the fullness and diversity of the brass section, although its role became progressively less important as time went on. RIAH SAHILTAAHK anticipates the forthcoming masterpieces such as MEKANIK, KOHNTARKOSZ and THEUSZ HAMTAAHK. Recorded from April 5 to 10, 1971 at Studios de Michel MAGNE by Dominique BLANC FRANCARD.